Head over to the Dotsero/Glenwood Springs area for a day trip that's hot, hot, hot. Dotsero Crater, just north of I-70 near the town of Dotsero, is more than meets the eye. On the surface, the crater measures over 2,000 feet in diameter and several hundred feet deep, which is something to behold. But when you look deeper, you find more about Colorado's geological past ... and a whole lot of magma. Yes, Colorado has an active volcano, and it offers a day of outdoor fun for everyone. Rated as a moderate threat by the U.S. Geological Survey, Dotsero last erupted about 4,200 years ago, which is about the time the Great Pyramids were being built in Egypt. It's only considered active because it has erupted within the last 10,000 years. The threat rating comes from the impact of an eruption rather than its likelihood. In other words, Dotsero is dormant, and you can hike it in all its glory without fearing the magma flow any time soon. And what a hike it is! 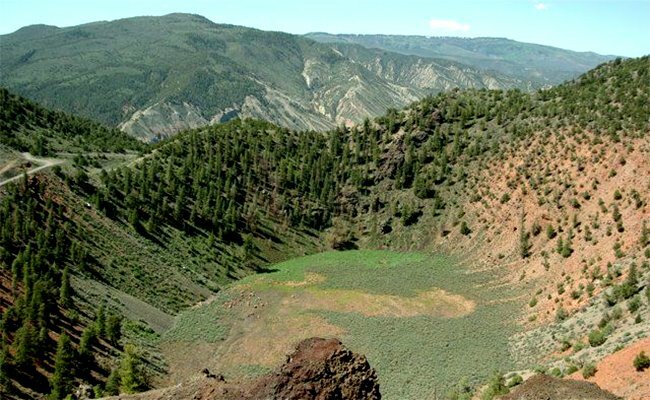 You can trek the Dotsero-Ute Trail to the edge of the crater, taking you to 7,300 feet above sea level looking straight into Colorado's geological history. The out and back hike is three miles one way (six miles total) with a gain of about 1,850 feet in elevation. Hikers say that the incline can be a little steep at certain sections and the trail signage is lacking, but the trail is pretty obvious, so prepare accordingly. Along the way, you will see evidence of volcanic rock, red soil, and what are referred to as "Dotsero Diamonds." These shiny specs embedded in some of the volcanic rock aren't actually precious gems, but instead, they are pieces of quartz that were picked up by the lava as it flowed and trapped when it solidified. Directions: Take exit 133 to Dotsero. Drive North on Colorado River Road for 0.5 miles to the trailhead. Trail: 6 miles, out and back. After hiking the volcano, you'll be more thankful than ever that it still has magma flowing through its underground veins. That's because Glenwood's hot springs are just 18 miles and 20-or-so minutes down the interstate from Dotsero, and the same magma source for the volcano heats the spring water! Nothing is better than a soak in hot springs to relax those tired muscles after a day on the trail. In addition, stopping by the gives you a chance to follow the geo-thermal resources of the natural wonder you just hiked to another natural wonder that they feed. Now that's some serious geology tourism! 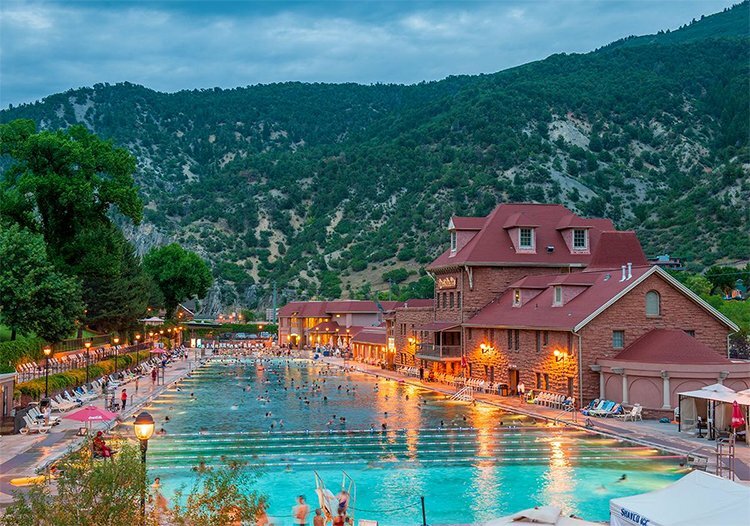 For over 130 years, guests have enjoyed the soothing mineral waters of the world’s largest hot springs pool at Glenwood Hot Springs Resort. The water contains 15 minerals and can be enjoyed year round, and because it is heated by underground magma, it doesn't have a sulfur smell! And, if you decide that a little more relaxation is needed, you can get a room at the hot springs' lodge, check out Iron Mountain Hot Springs, or head over to the Yampah Vapor Caves. Courtesy of Glenwood Hot Springs Resort. What do you think? Have you hiked the Dotsero Crater before? Let us know in the comments below! Colorado getaways for every month of the year!